View more Powerpoint from Slideshare. 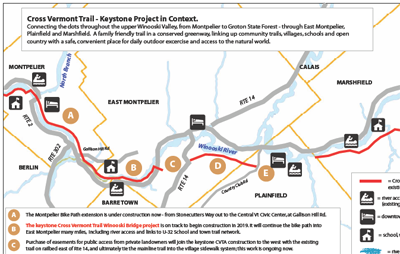 The trail is connecting together communities, their schools, and the natural areas between. You can help! 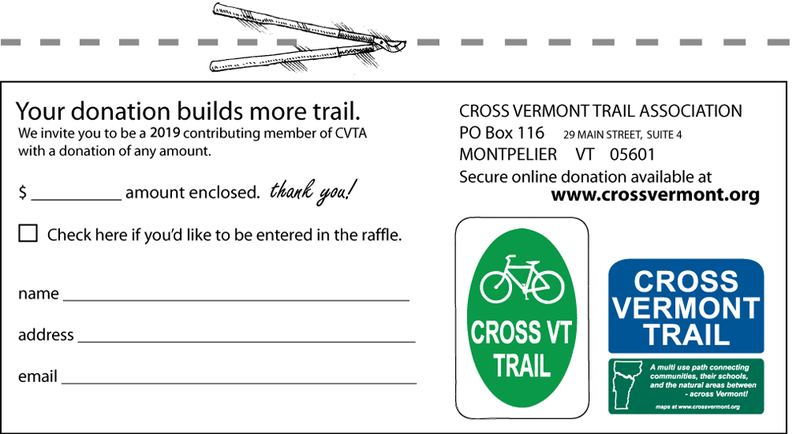 The Cross Vermont Trail Association is an incorporated, private non-profit, member based and volunteer driven. Everyone is welcome to join. 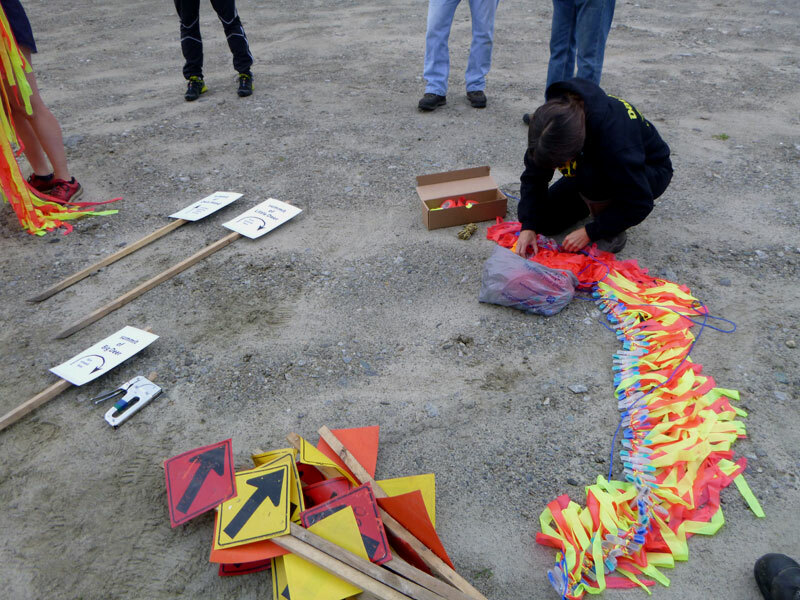 Register early for discounted entry fee: Full details and registration info. 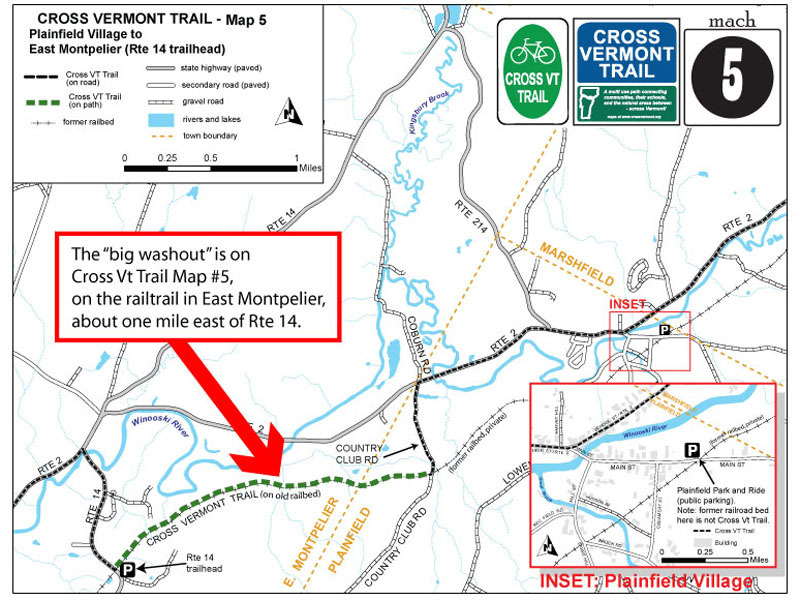 We're getting the Cross Vermont Trail off the shoulder of Rte 2 and onto a path in the woods - in East Montpelier. Finally, the pieces are all coming together. 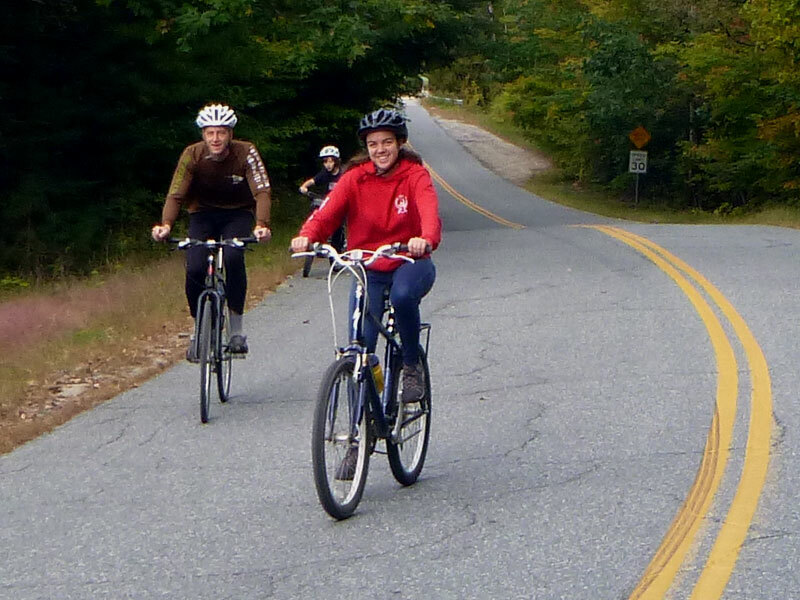 We're aiming to build miles of new trail and a big bridge over the Winooski River. It's going to be pretty cool. Learn more. in local donations to get the job done. 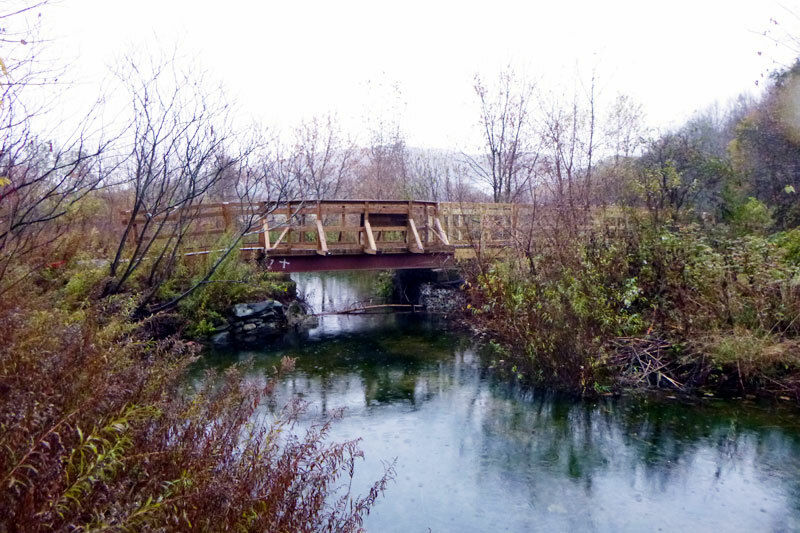 Now - if you make a donation of $50 or more you can show your "Build the Bridge!" 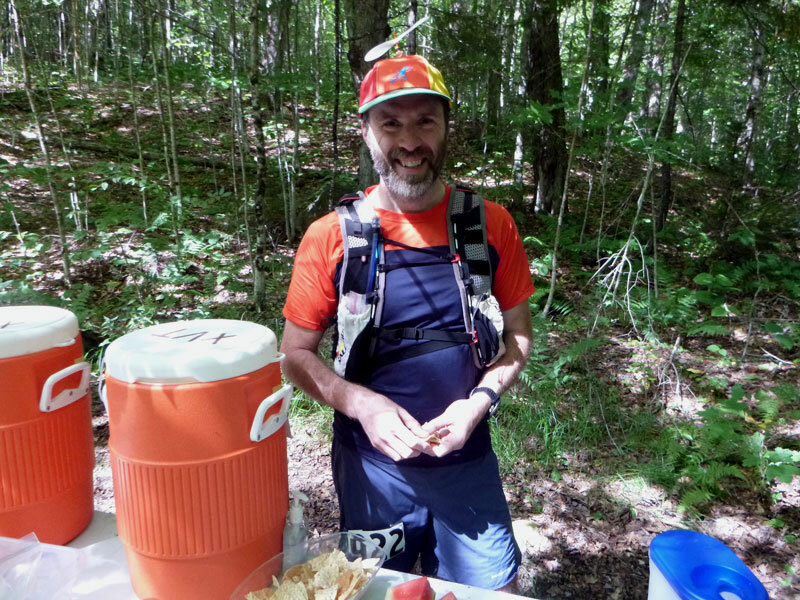 pride with the new Cross Vt Trail t-shirt we'll send you. Give us a shout to get yours. 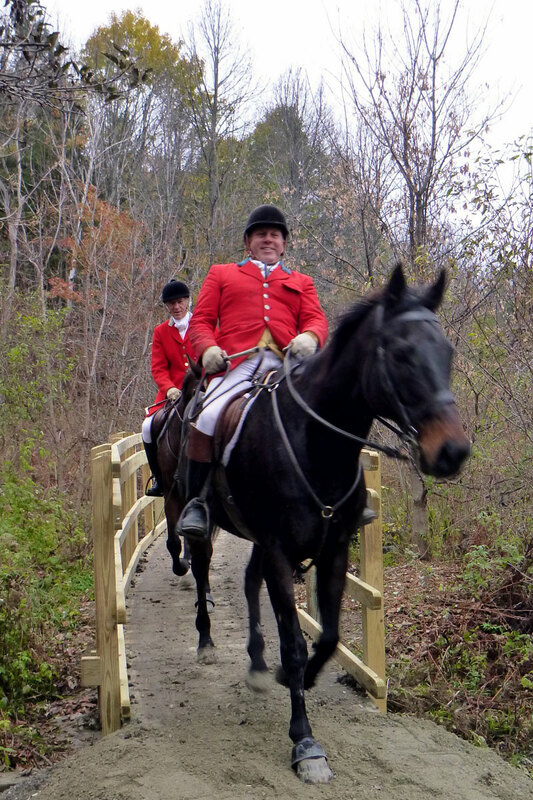 Town Meetings to support funding for "Build the Bridge!" 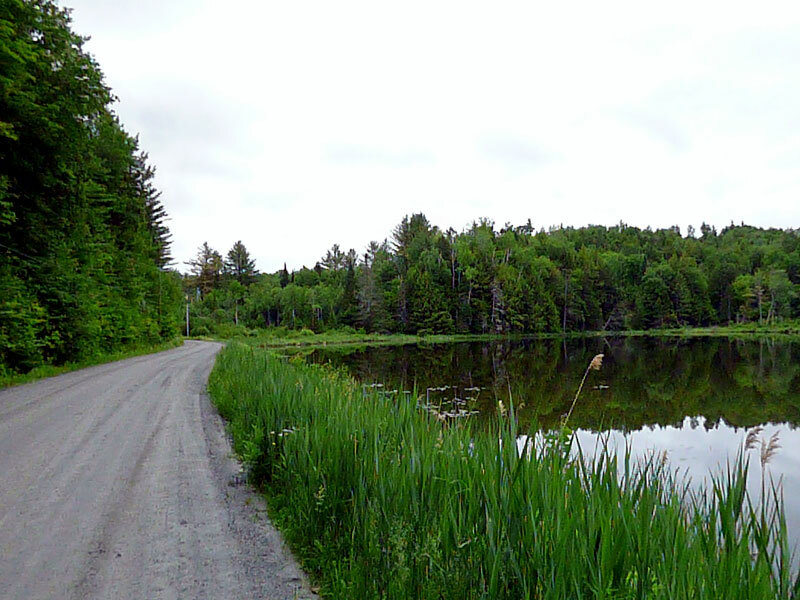 We're in the homestretch ~ read and share the whole story. 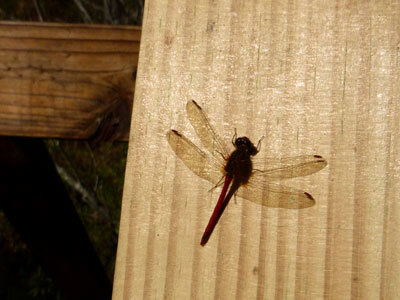 Spring begins, some news round up. 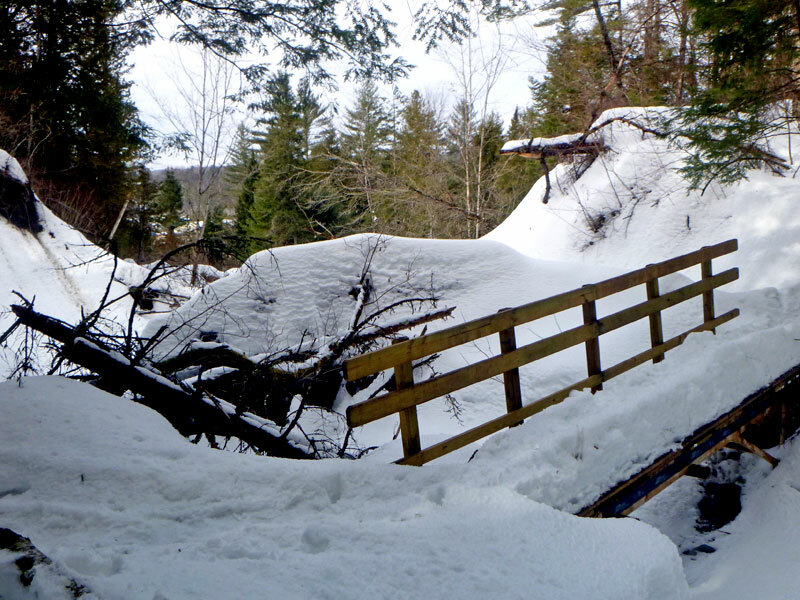 The mighty little temporary bridge at the Big Blowout on the railtrail in East Montpelier has actually lasted pretty well for another winter. Looks like it's going to make it fine until this May when the permanent repair is finally going to be built. You can help! Give a shout if interested. 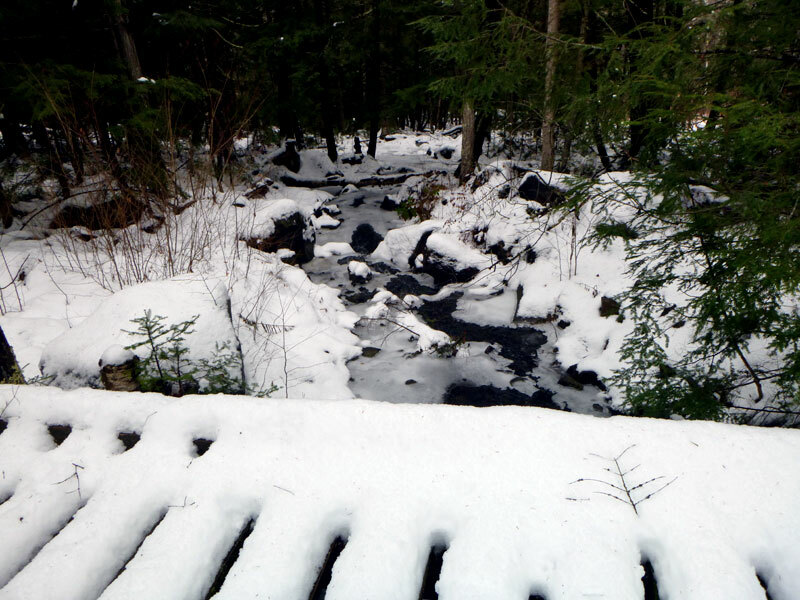 This winter also got closer to finally replacing the log bridge on Mallory Brook Trail, dragging down the cedars needed for the second stringer. 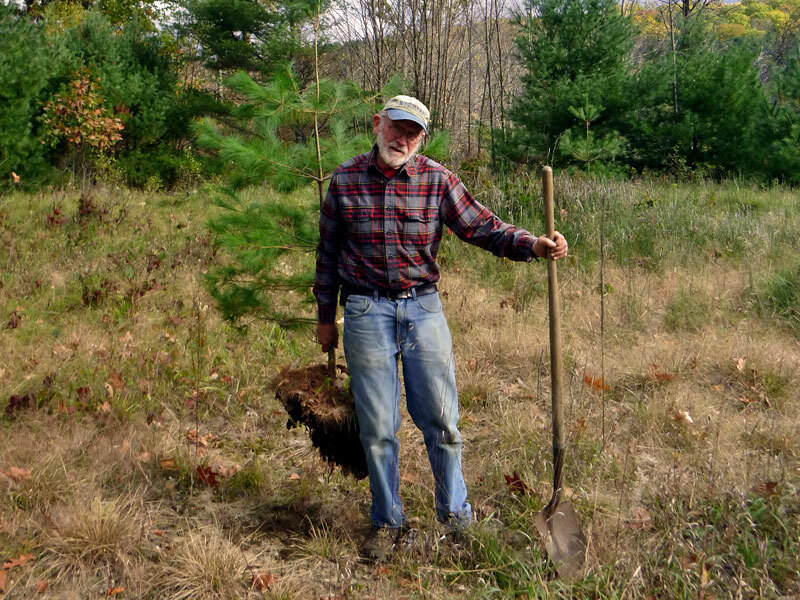 You may say this has taken a while, but I remind you these logs were started from seed. 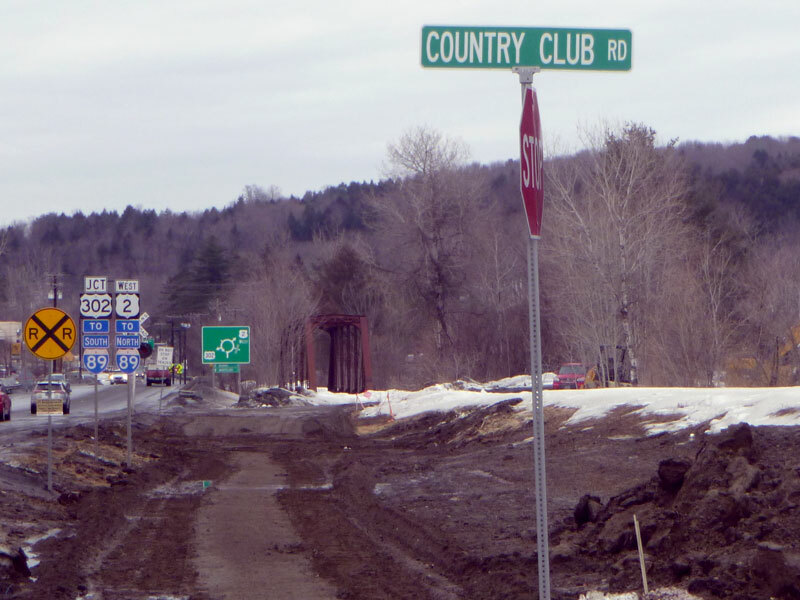 And the Montpelier Bike Path out alongside Route 2 and over to the Civic Center on Gallison Hill Road is really coming along; undaunted by neither rain nor sleet nor snow. 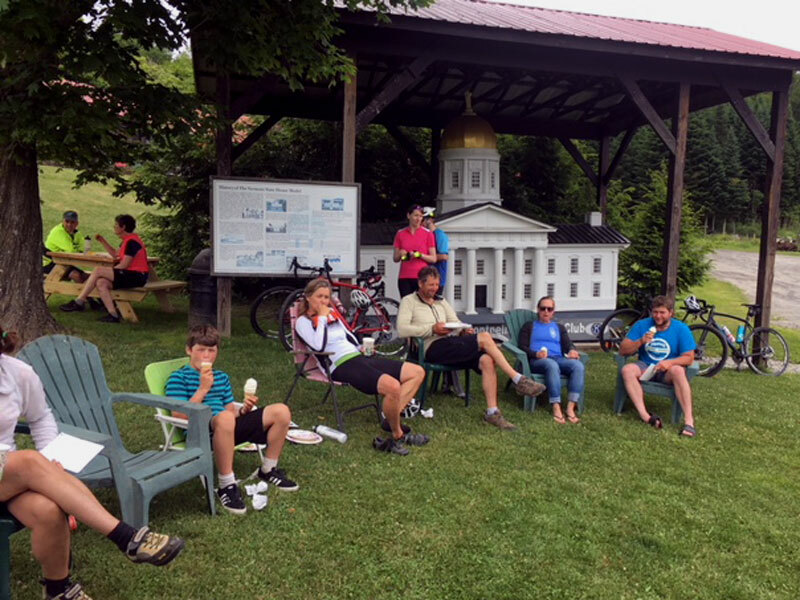 We are on track to keep it going with the Cross Vermont Trail Winooski Bridge project, which will pick up where the Montpelier Bike Path ends and will continue to U-32 and on across East Montpelier. We're waiting for nice summer weather, though, not going to lie. 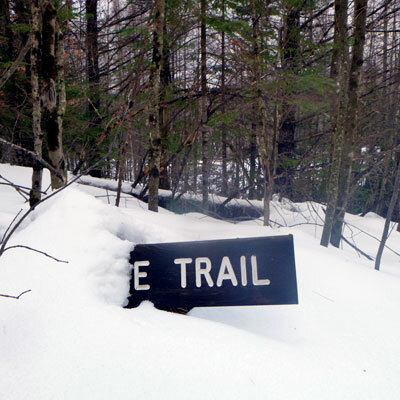 First Day Hike 2019 - good snow and good exploring at the Groton Nature Trail. 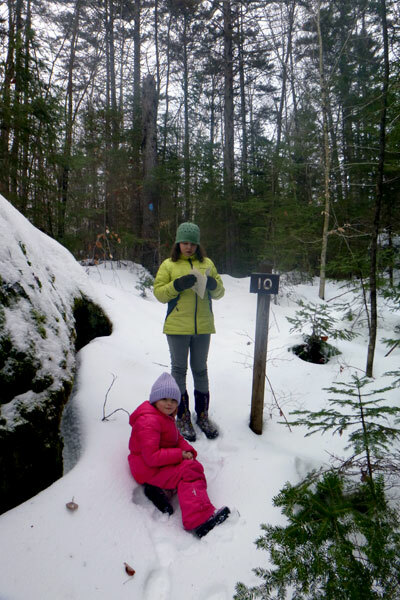 Welcoming in the new year in the fresh air and celebrating state parks. We can report that, based on our observations while hiking around all of the nature trail interpretive stations, that there are numerous very large boulders in Groton State Forest, which seem to be somewhat out of context and so we judge that they probably rolled into there current positions from elsewhere, but that all this likely happened long ago as indicated by the amount of moss seen at present. Unlike all of us in the New Year, no moss gathering for us! Or maybe just a little. 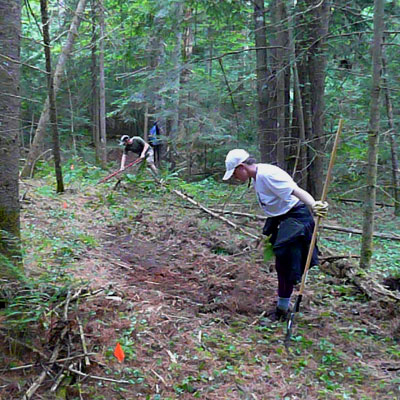 Our Annual Appeal - help build new trail in 2019. 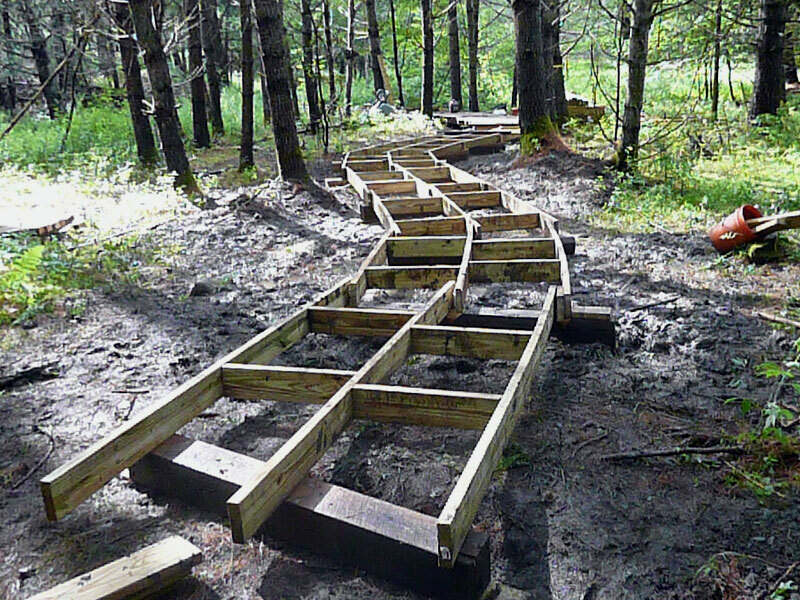 I have to admit, it was a fun year for trail projects in 2018, and 2019 is shaping up to be even more meaningful. 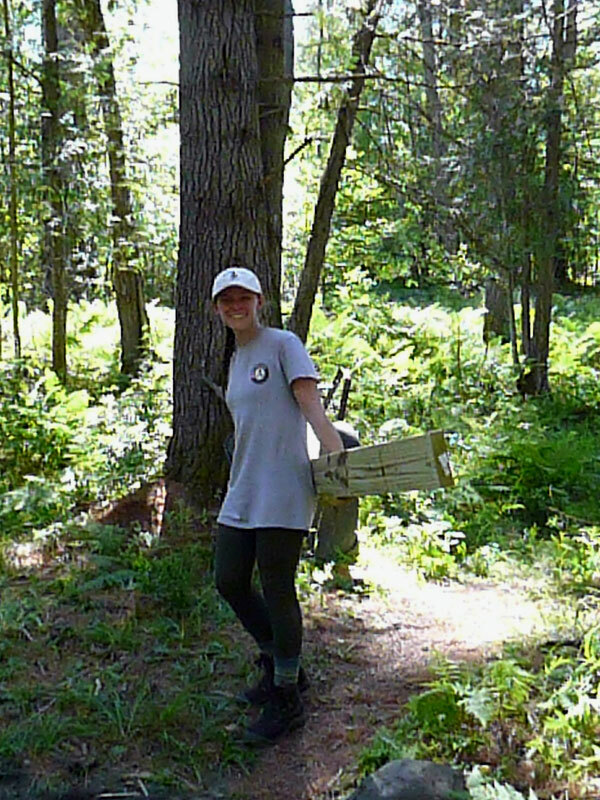 Last summer, with our expanded Americorps crew and many volunteers, we tackled significant trail improvements across the state ~ [and here I'm going to avoid the phrase "but we didn't finish" and use instead something like "and there's plenty more to go!"] ~ "and there's plenty more to go!" 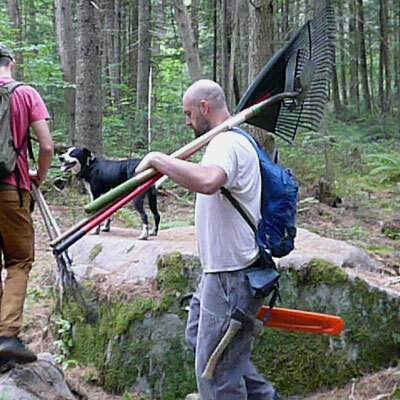 As soon as the snow melts next spring, we will be picking right back up on projects in Wells River on the railtrail, fixing "the big washout" in East Montpelier, and finishing the Johnnie Brook Trail project started last fall. 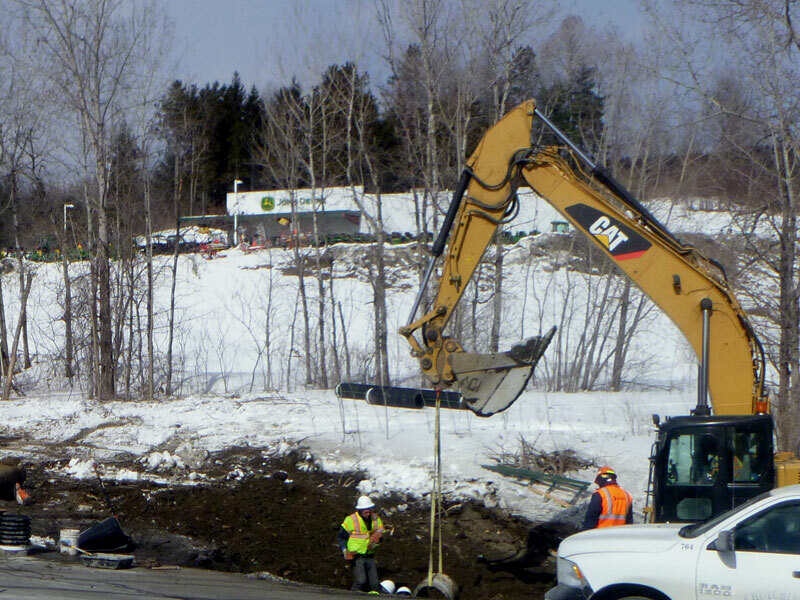 But even bigger than that, we will be working through the winter to prep all the final "under the hood" work needed to proceed to the final construction and break ground on the big Winooski Bridge project and trail relocation off of Rte 2. 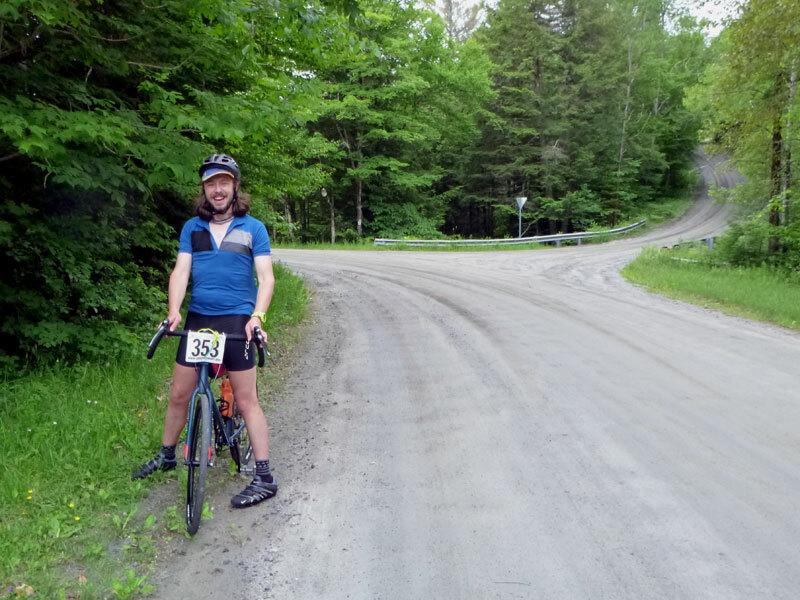 Regular donations from folks like yourself - all of us who use and value community trails - are the glue that holds together the whole enterprise. 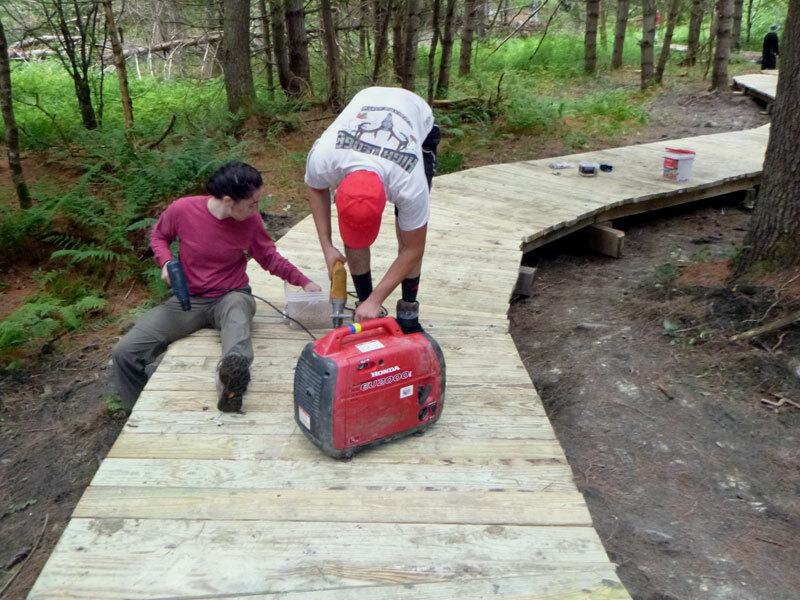 Your donation of any size will be leveraged by, and allow us to make use of, larger funding grants that have matching requirements, supplying tools and materials to volunteer workers, helping students learning out on the trail in class projects, and much more. Thanks again for your help and participation! Read more in a our full annual letter here, or call anytime with thoughts or questions. 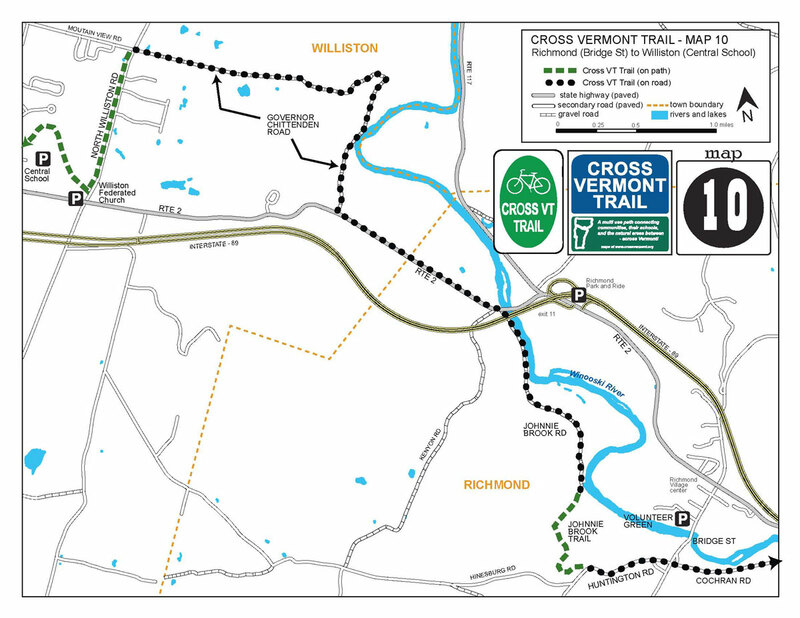 Cross Vt Trail WINOOSKI BRIDGE timeline, budget and plan. 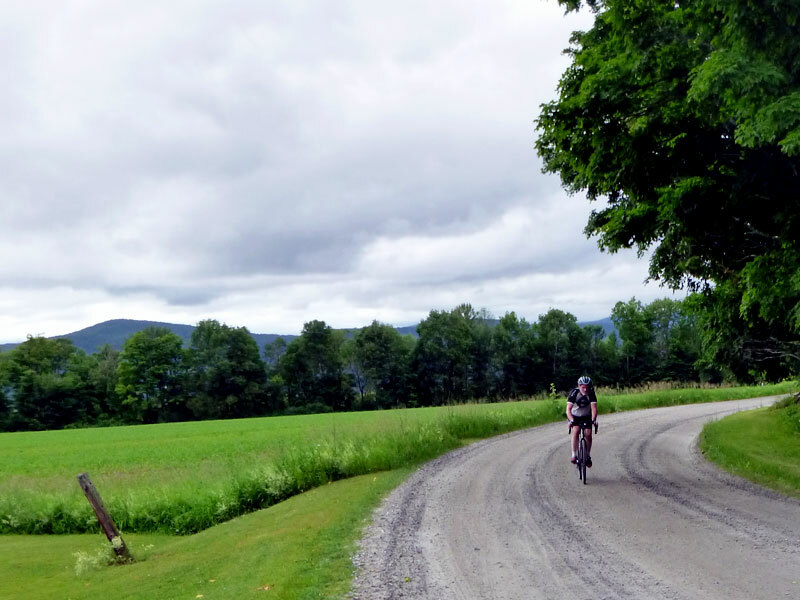 We have exciting news to share about progress on the Cross Vermont Trail Winooski Bridge and the big project to "get the trail off of Rte 2" - we are on track to be breaking ground in 2019. This is the largest project we will ever undertake and the keystone to our statewide route. 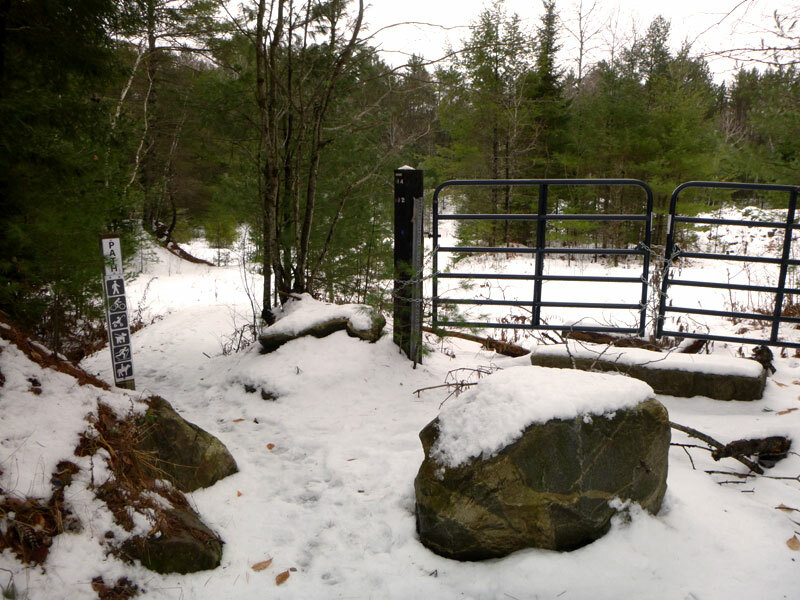 This past year has seen many long sought milestones finally achieved - we have complete engineering plans, we have all the various legal agreements with landowners in their final forms, and we are working through the last of the permitting applications this winter. And, yes, we are continuing to raise the final money needed to build the entire project. The whole thing will cost over one and half million dollars - most of which will be coming from larger grants - but at least $250,000 has to come from local donations. To date we've received $200,000 in local donations, and have just $50,000 to go! 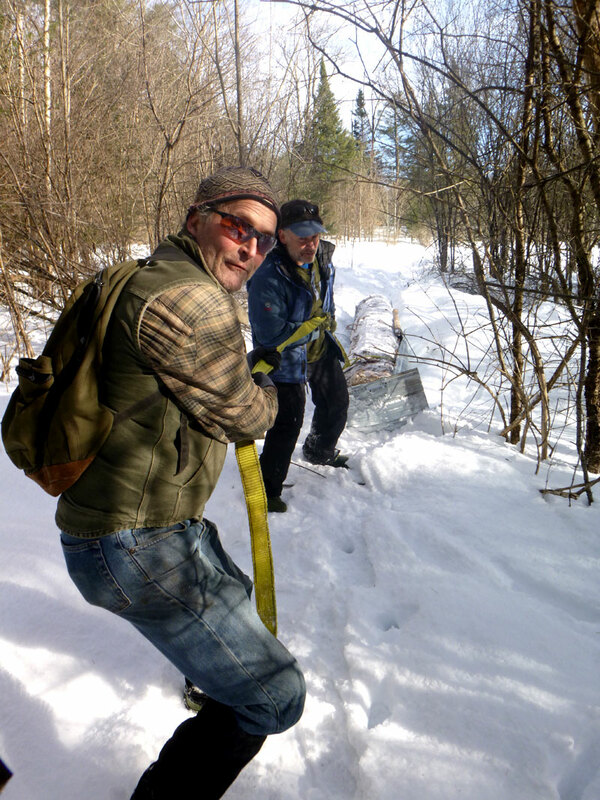 Setting aside the sysipheans for another season, today switched over the Cold Brook Path from summer non-motorized use to winter snowmobile trail maintenance. 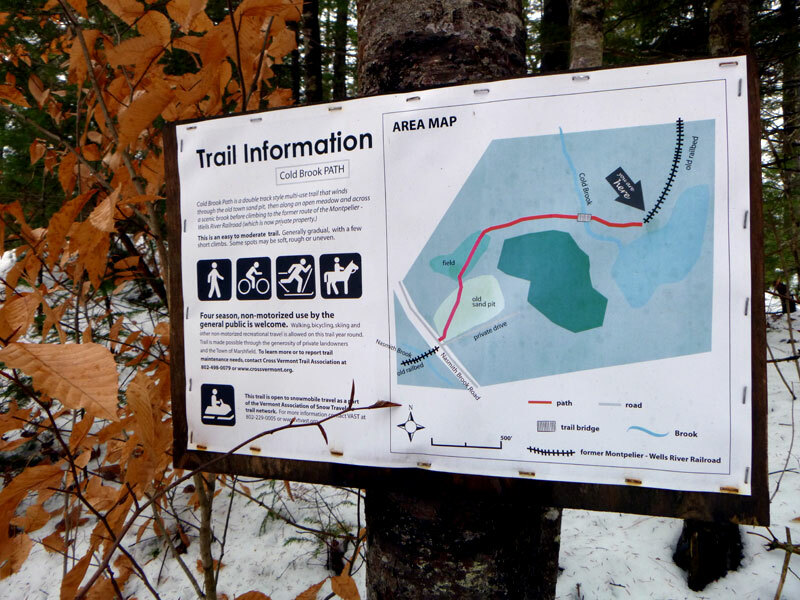 This path is a 'go around' generously allowed by Town of Marshfield and neighboring private landowners, to bypass a section of the old railbed that can't be used as a trail - east of Nasmith Brook Rd. 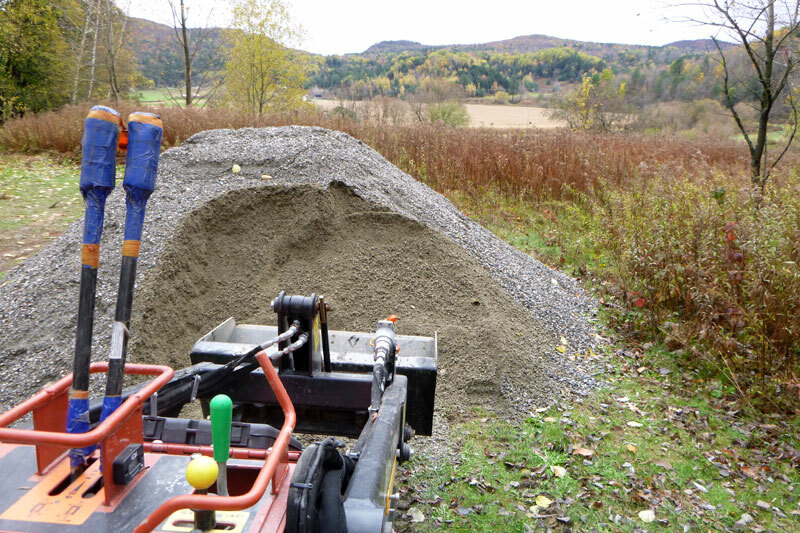 The Montpelier Bike Path construction from Stonecutter's Way out to Gallison Hill Rd is well underway. 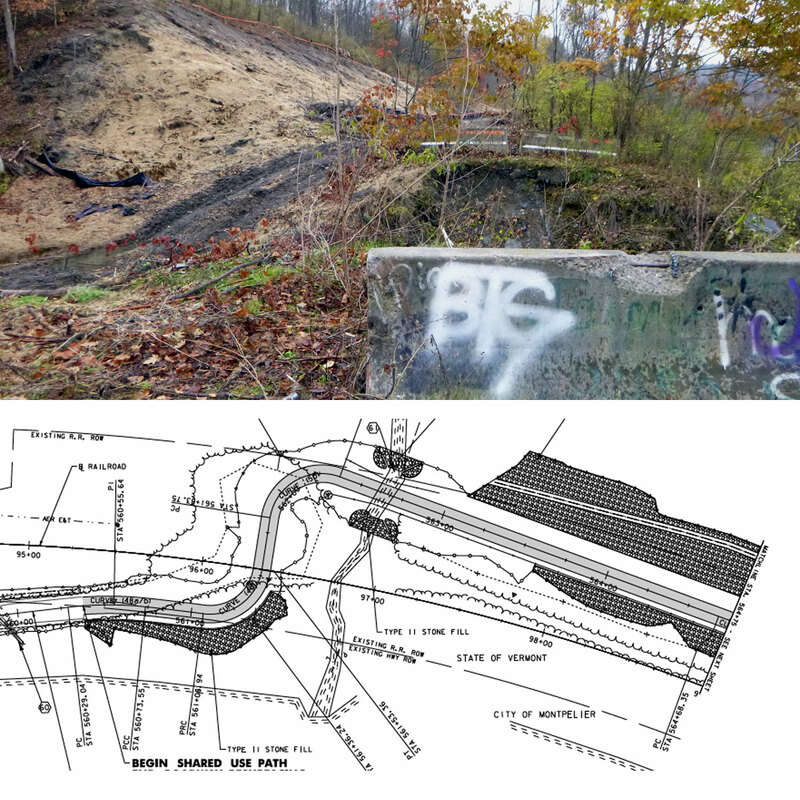 The Taylor St project gets all the press, with building demolitions and parking garage ponderings - but off in the woods, out past Pioneer St, across the river from Route 2 the long planned trail construction beside old railroad is emphatically and finally moving. 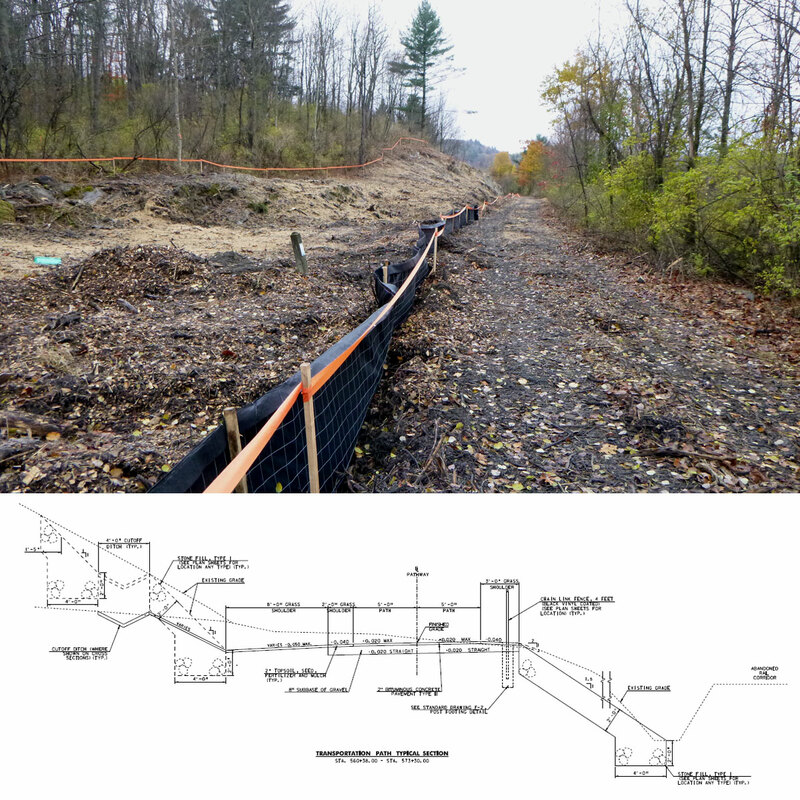 This construction will tie directly into the Cross Vermont Trail "Winooski Bridge" project at the base of Gallison Hill Rd, across from the Civic Center (ice rink). We're hustling now to get our own project ready to start construction next summer, so that everything can be connected up together at the same time. 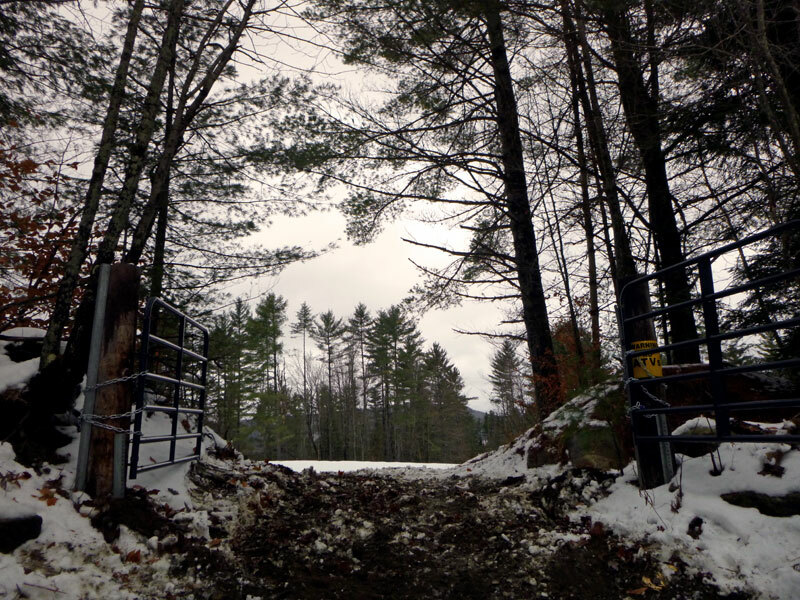 Stay tuned for updates later this winter, it's third and goal. 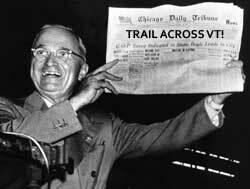 Hey we got one of those big checks again! 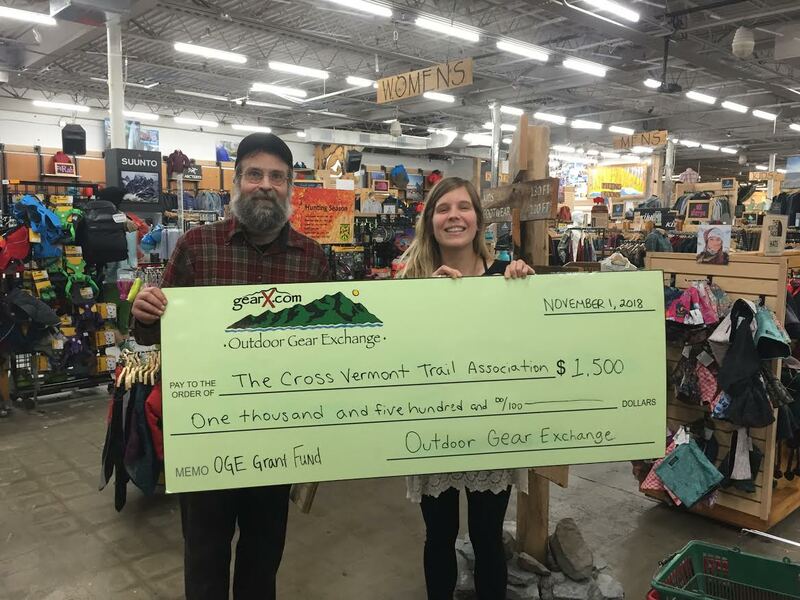 Thanks to Outdoor Gear Exchange for a donation to repair The Big Washout on the railtrail in East Montpelier. 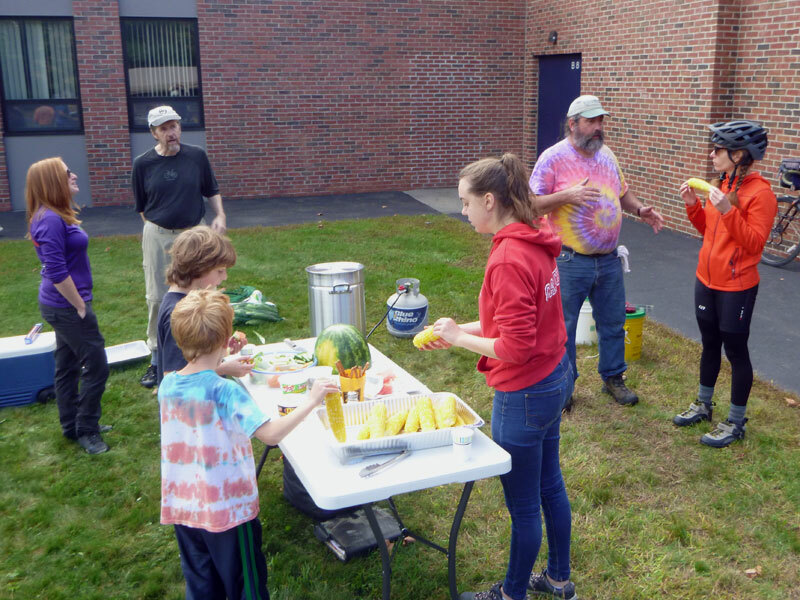 We've also received donations for this project from Oakland Foundation, North Country Federal Credit Union, Washington Electric Coop, and Ben & Jerry's Foundation. The whole thing is going to cost about $13,000. With the donations received so far, we are half way to that total. 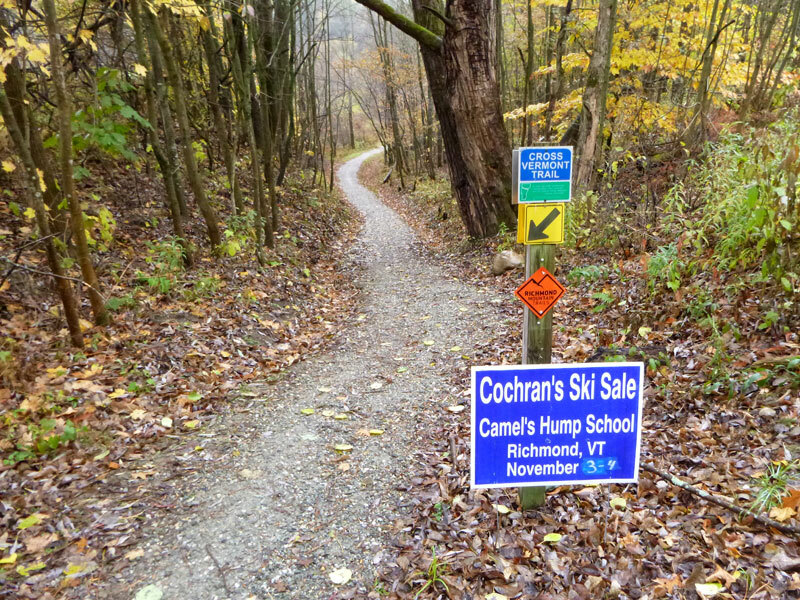 We're aiming to finish fundraising this winter and build the new trail next Spring. 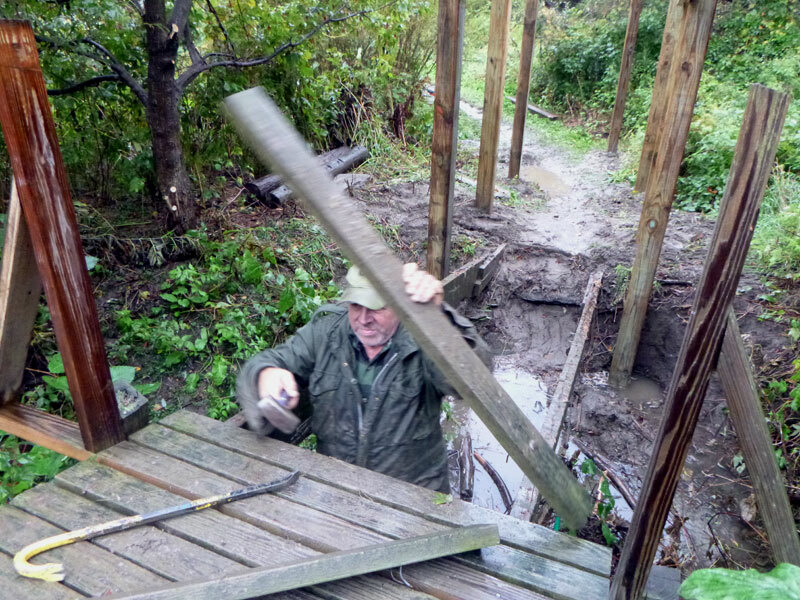 And yes, we know what you're thinking - "whose going to risk their luck crossing a $13K bridge" - and so, to you we offer to make a slightly nicer bridge for $14K (with your contribution . . . ). 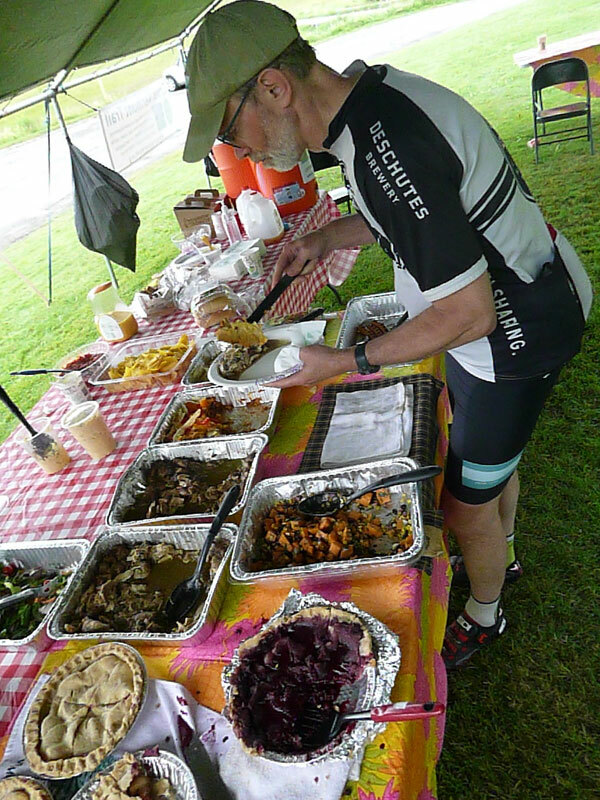 Any way, thanks again to OGE, Oakland, North Country, WEC and and Ben & Jerry's - and stay tuned, more to come. 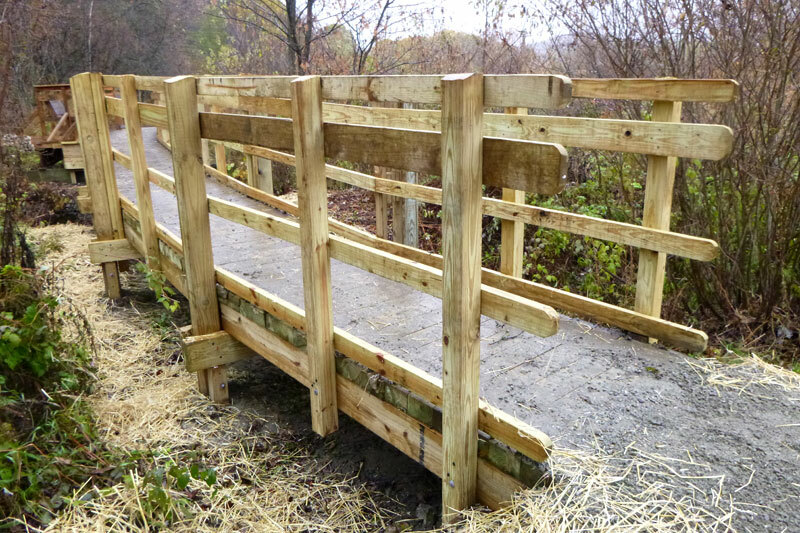 The Johnnie Brook trail bridge big rebuild is fully open. 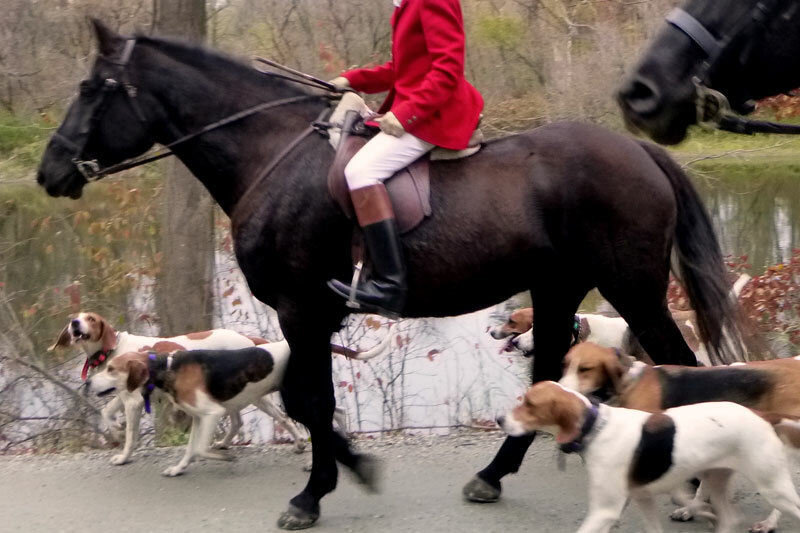 The hounds sniffed it right out. 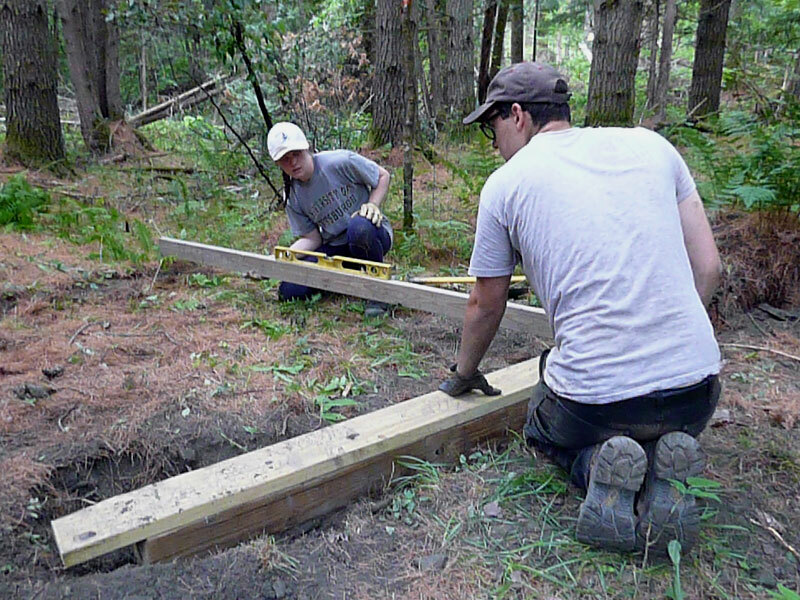 We bought the lumber and hardware with generous donations from Essex Rotary, the Town of Richmond Conservation and Trails committees, the Green Mountain Hounds - and from individuals like you, thanks everyone! 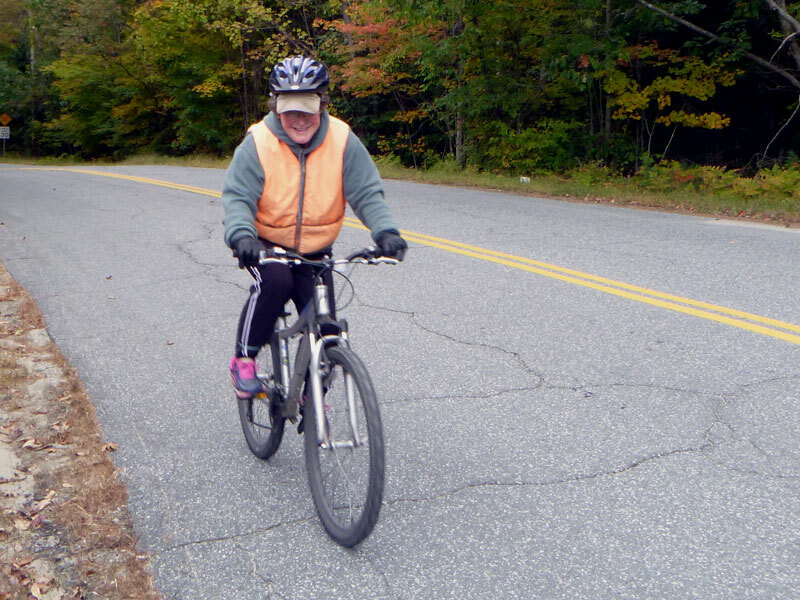 This is on Map 10 of the Cross Vt Trail route, in Richmond. 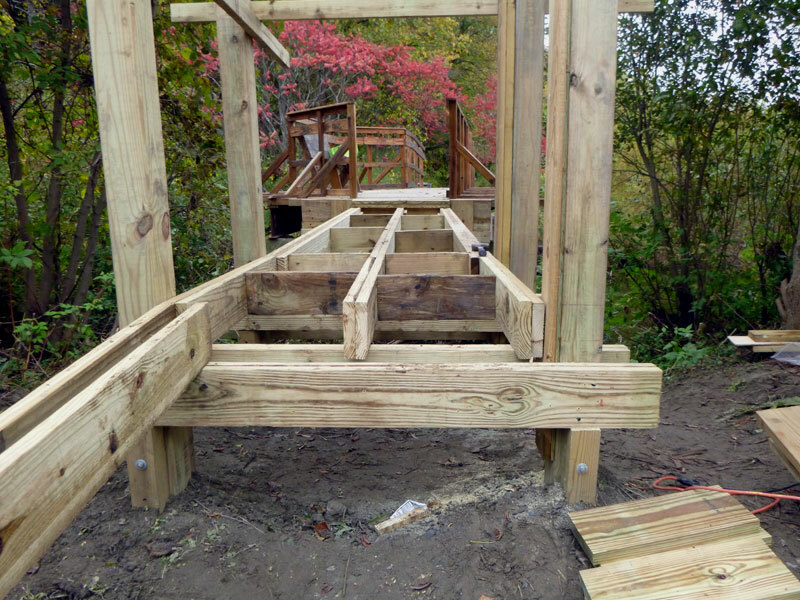 But wait there's more, next up will be freshened deck on the dogleg boardwalk (so called) and last regraveling the remainder slick spots - and the long and winding post Irene reboot will be done. End is in sight - as much as next Spring is ever in sight? 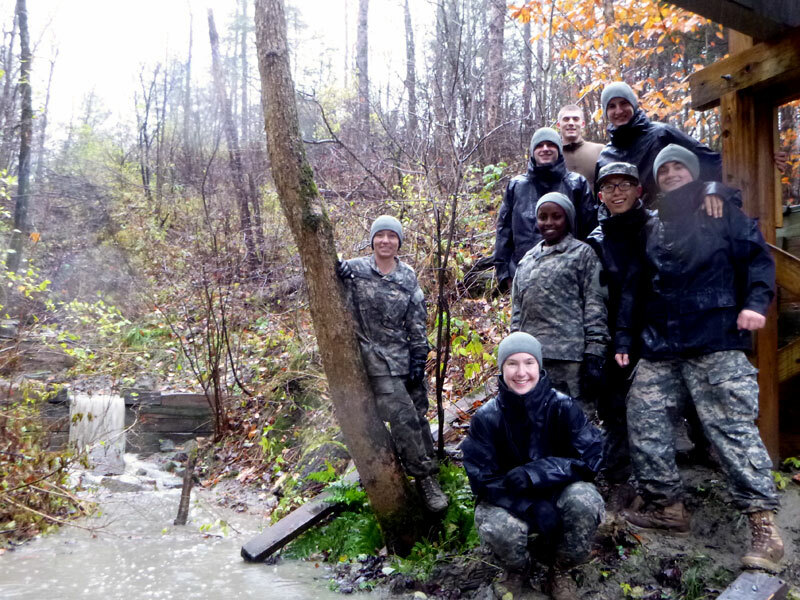 Beefing up erosion control check dams yesterday with student volunteers from Norwich University; a stitch in the nick of time. Rails are up on the new approach to Johnnie Brook bridge in Richmond. Next, bring in a bunch of gravel to ramp up and match the new bridge deck . . . until then careful on your bike, there's a big step at the end of the bridge. Take me to your cedars. 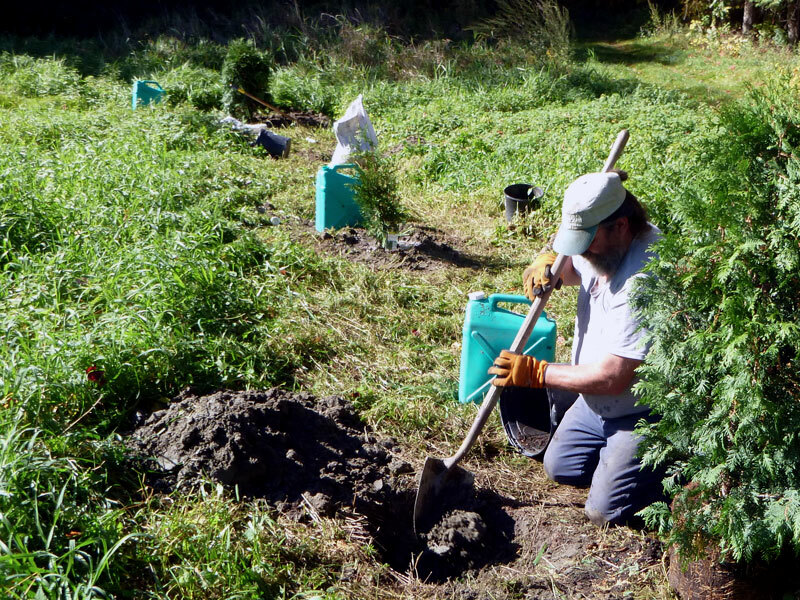 Tree planting along the rail trail in Wells River this past weekend - to define and buffer the trail, to counteract noxious invasives, and to appreciate the feel of black dirt between our fingers. 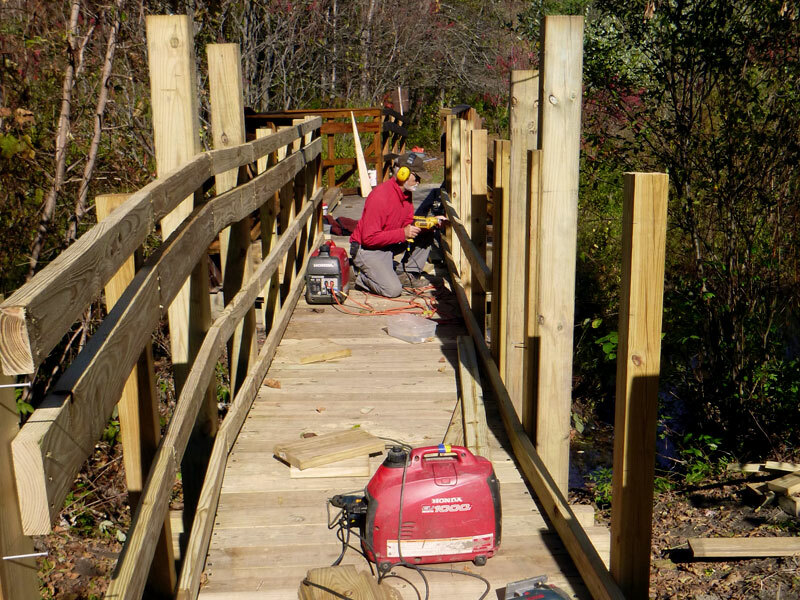 Closing in on the end game for the Johnnie Brook Trail Bridge Big Rebuild. 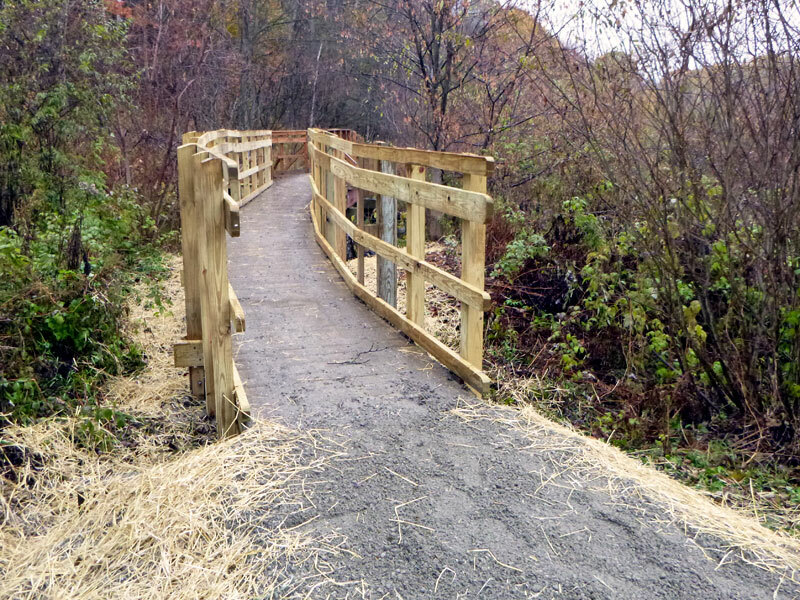 Phew, this trail has gotten pretty popular, having to stop work often to reassure bikers and dog walkers "Sorry, it's almost done, just need to add a few more alligators to the moat!" 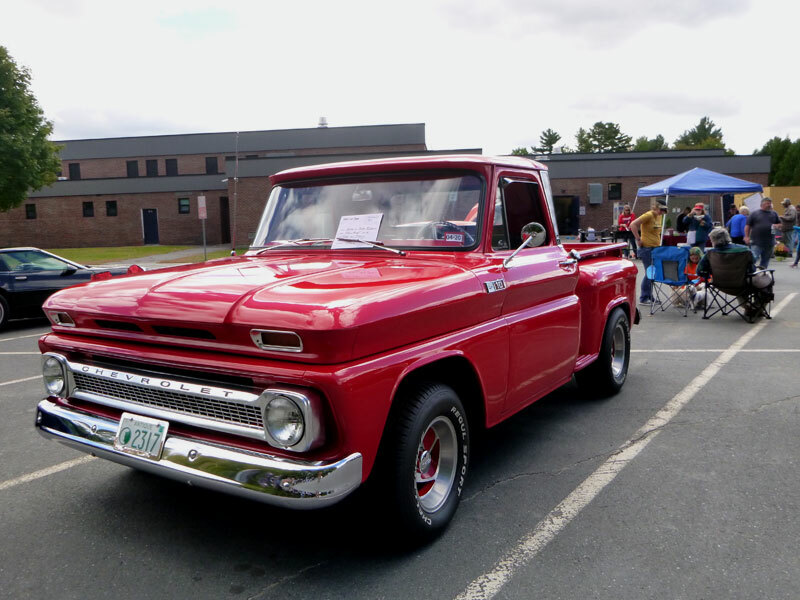 Beautiful day for 21st annual Fall Foliage Ride - and go figure the whole thing wrapped up at a classic car show at Blue Mt. Union, twofer! 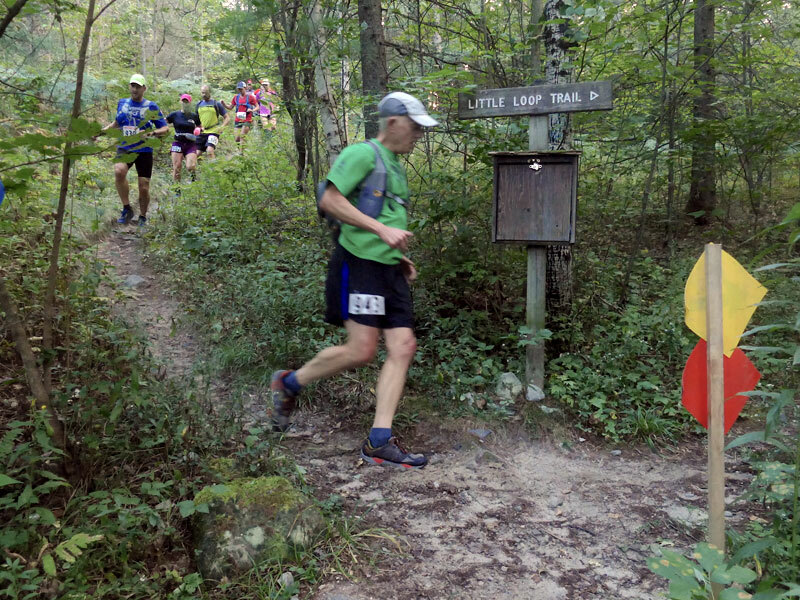 Great day at the first annual Groton Forest Trail Marathon. 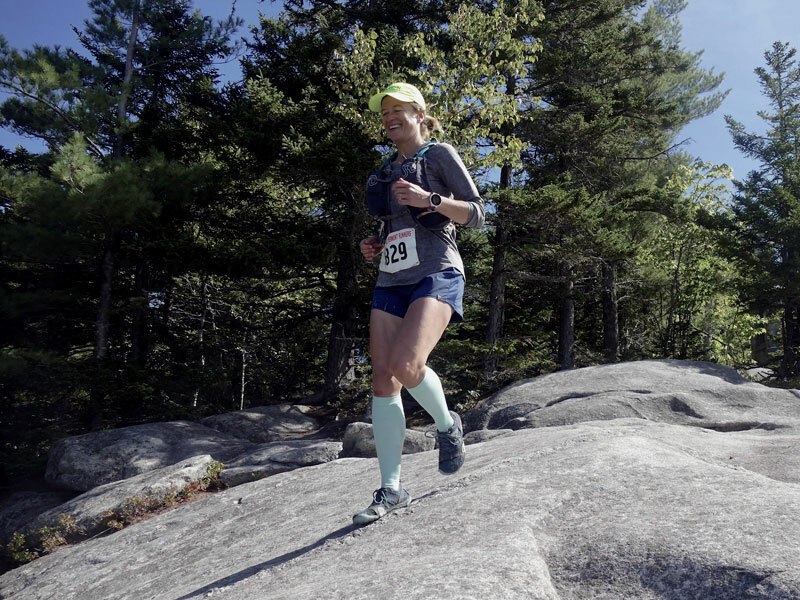 100 runners, lots of smiles, even on the pretty tough course that flows from rail trail, to bouldery shorelines, to multi-use trails, and over three mountain peaks. 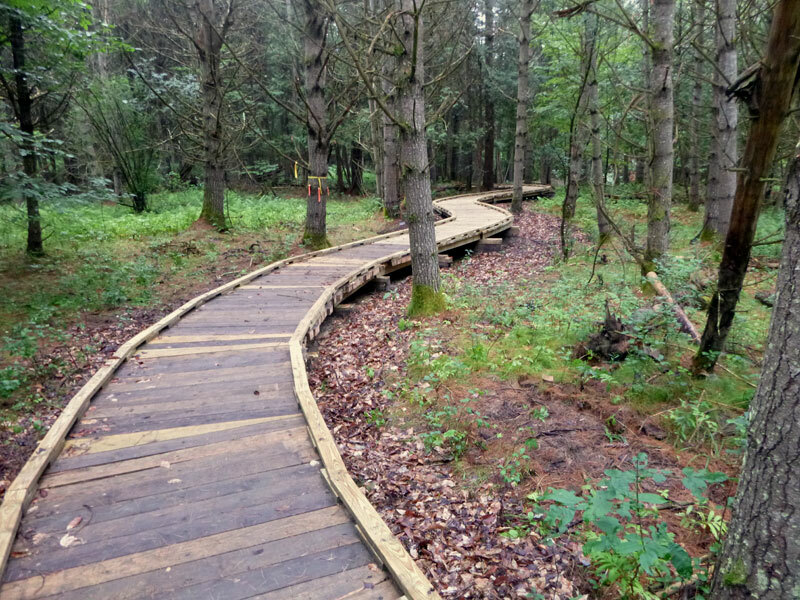 Great to see so many people out enjoying the trails we've been helping to build and connect together! 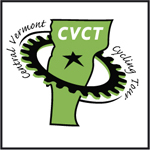 2018 CVTA volunteer trail crew has wrapped a powerful three weeks of work. 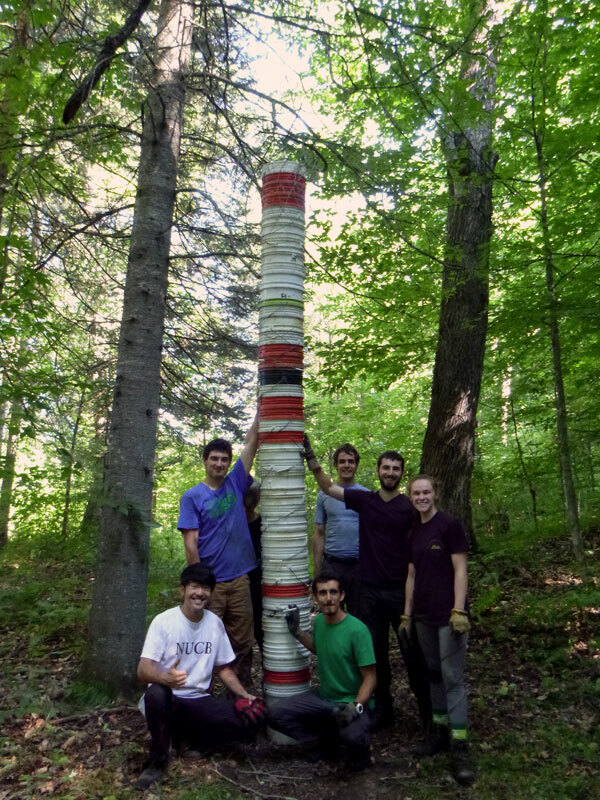 This year, we used all the buckets. 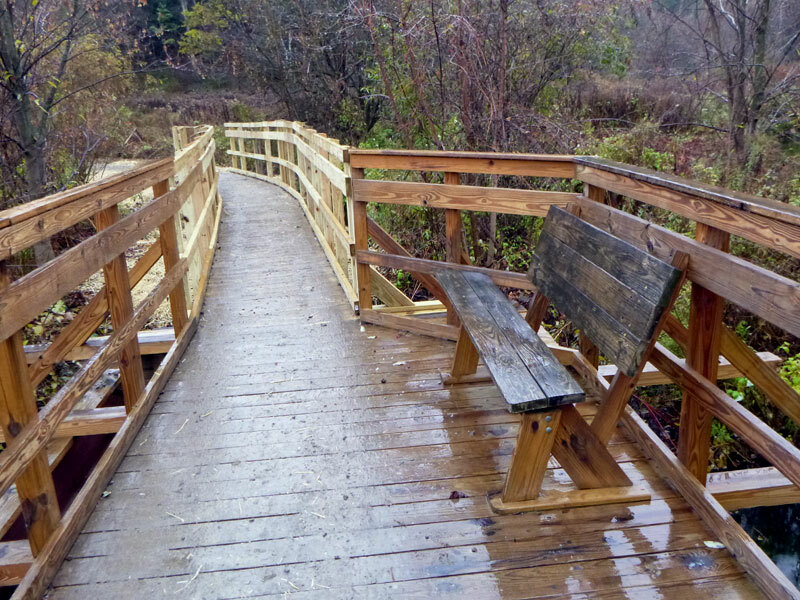 Karen Clark Trail, between U-32 and Wheeler Road, is OPEN for bikes - boardwalk and other upgrades complete. 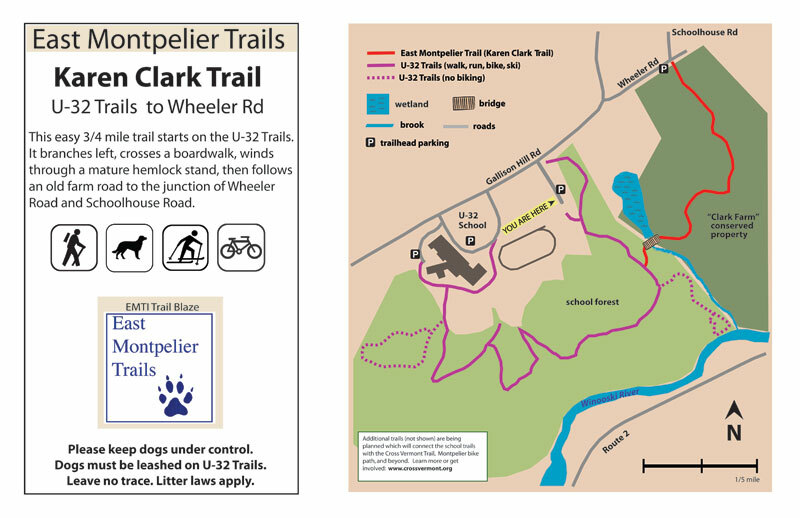 Trail work Sat 7/21 - meet U-32 tennis courts 9 AM - extending boardwalk on Karen Clark Trail to work better for bikes. Implication: leisurely artisanal carpentry. 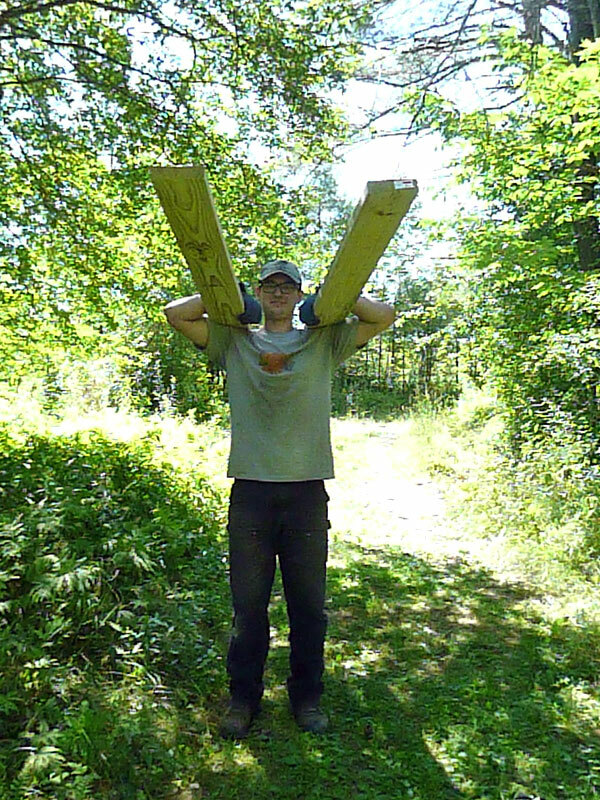 Reality: carrying lumber AND leisurely artisanal carpentry. 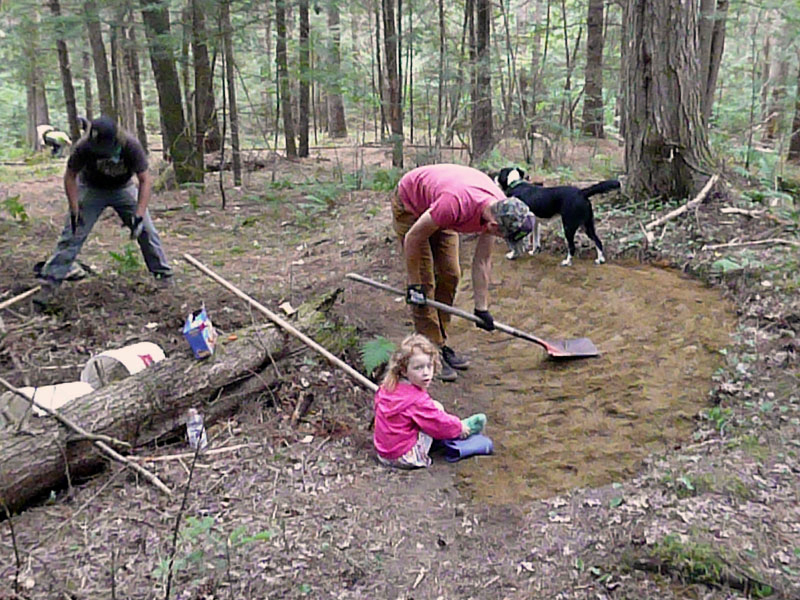 Fun day on Saturday making new Mt. 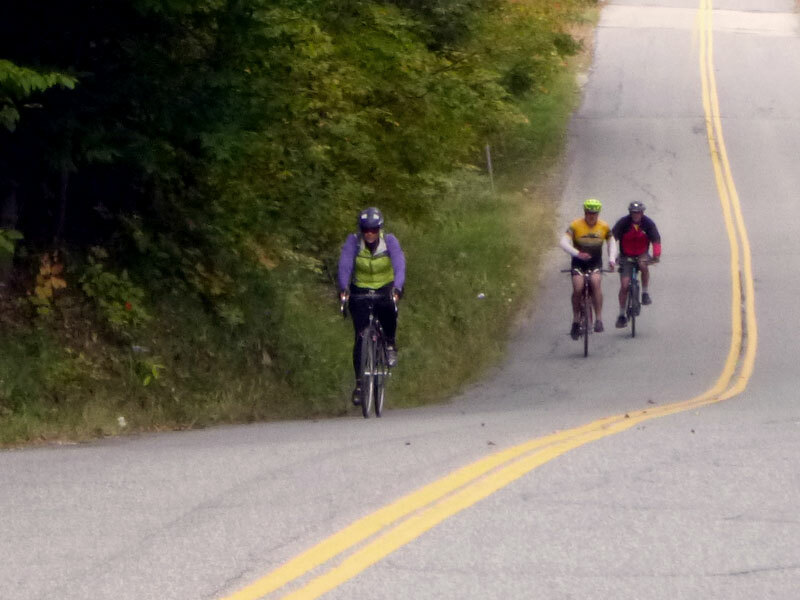 Bike trail at Twinfield with the local VMBA chapter "Riders in Plainfield and Marshfield" (RIPM!). 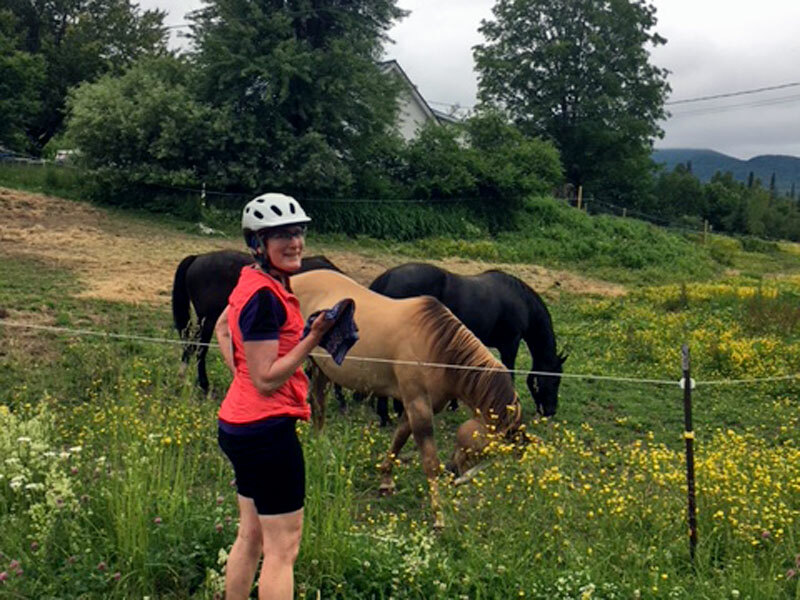 Turned out to be a great day for riding at Sunday's Central Vt Cycling Tour - cool, cloudy but bright with nary a drop of rain. 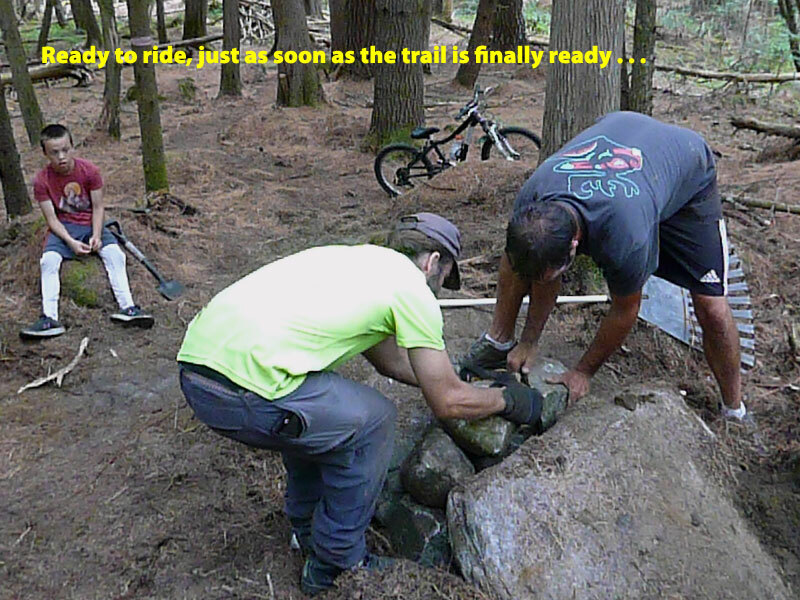 Good times had by all, and raised a little extra to help build more trails and bike paths. Thanks everyone and see you next year! Feature articles on XVT . 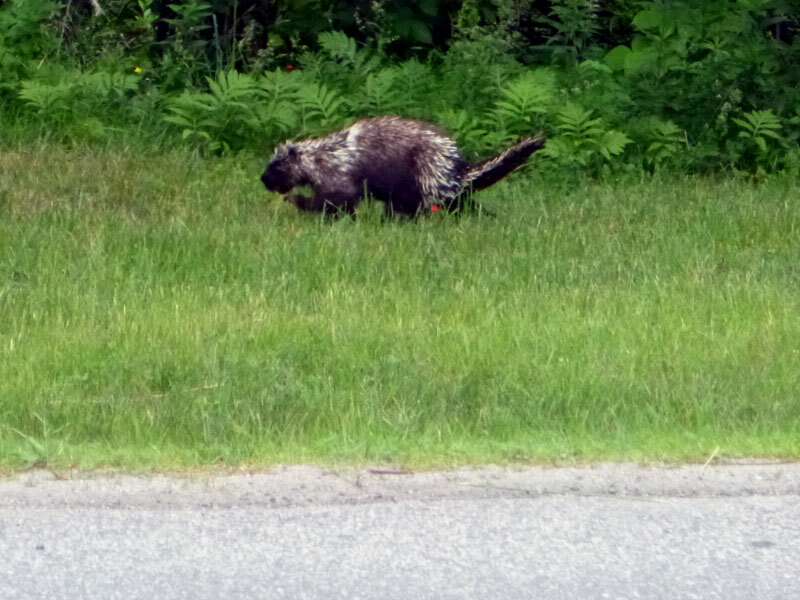 . .
WCAX - TV is the big time! 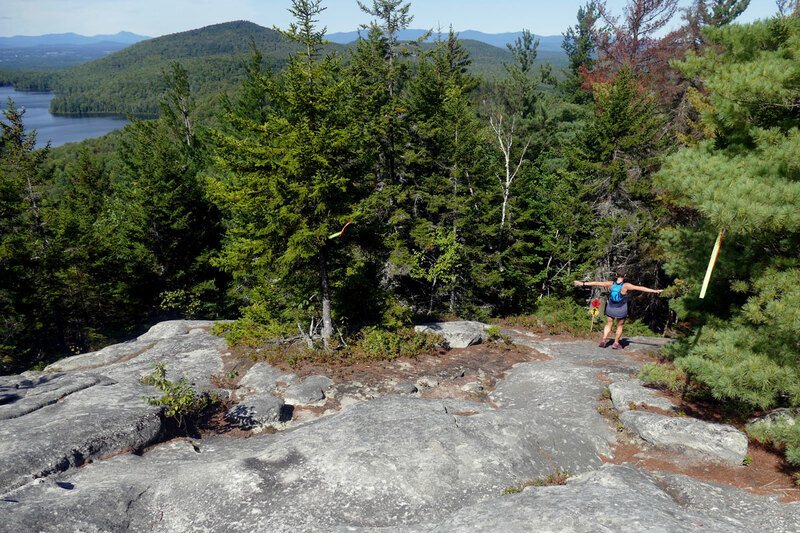 on the Cross Vermont Trail route. Just finished your own journey? Let us know what you saw! 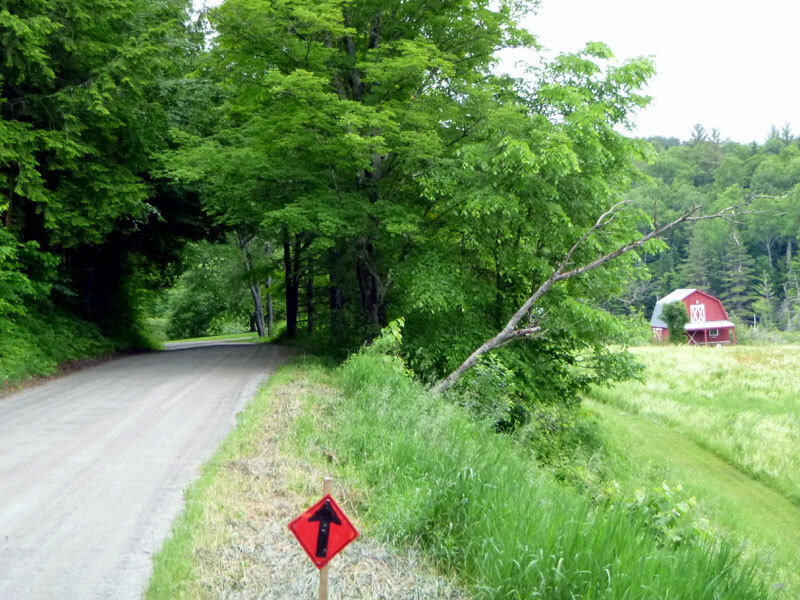 Guidebook to nature and history along the Cross Vermont Trail. Look beneath the surface. 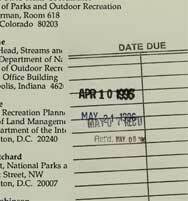 Explore the landscape of the trail.
. . . and more in our news archive page.